I'm trying to get back in to writing again. After spending several weeks indexing my sources, I thought I was ready to go. But it turned out that my home computer wasn't working well (talk about the shoemaker's child going barefoot!). So I was delayed again. Well, I think I'm past those issues now - mostly I have to get into the routine of regular writing. Usually a good way for me to do that is to start a series of related posts. 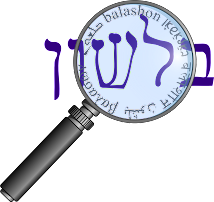 I came up with the idea of discussing the words in the mnemonic פרד"ס PaRDeS: פשט peshat, רמז remez, דרש derash, סוד sod. Of course it made sense to discuss the word pardes פרדס itself, and its connection to the English word "paradise". So I checked my newly-created index, and lo and behold - everyone and his uncle has something to say about pardes and paradise. I'm not quite sure how to start, so I guess I'll just quote a source, and then add on additional sources that have something new. From Avestic, of Old Persian origin. Compare Avestic pairidaeza (= enclosure), which is compounded of pairi (=around) and daeza (=wall). The first element is cognate with Greek peri (=around, about). The second element is cognate with Greek teichos ( = wall). Greek paradeisos (= park, the garden of Eden, paradise), whence the Latin paradisus, is also of Old Persian origin. Aramaic פרדס, פרדסא is borrowed from Hebrew. c.1175, "Garden of Eden," from O.Fr. paradis, from L.L. paradisus, from Gk. paradeisos "park, paradise, Garden of Eden," from an Iranian source, cf. Avestan pairidaeza "enclosure, park" (Mod. Pers. and Arabic firdaus "garden, paradise"), compound of pairi- "around" + diz "to make, form (a wall)." The first element is cognate with Gk. peri- "around, about" (see peri-), the second is from PIE base *dheigh- "to form, build" (see dough). The Gk. word, originally used for an orchard or hunting park in Persia, was used in Septuagint to mean "Garden of Eden," and in New Testament translations of Luke xxiii.43 to mean "heaven" (a sense attested in Eng. from c.1205). Meaning "place like or compared to Paradise" is from c.1300. The history of paradise is an extreme example of amelioration, the process by which a word comes to refer to something better than what it used to refer to. ... Zoroastrian religion encouraged maintaining arbors, orchards, and gardens, and even the kings of austere Sparta were edified by seeing the Great King of Persia planting and maintaining his own trees in his own garden. Xenophon, a Greek mercenary soldier who spent some time in the Persian army and later wrote histories, recorded the pairidaeza- surrounding the orchard as paradeisos, using it not to refer to the wall itself but to the huge parks that Persian nobles loved to build and hunt in. This Greek word was used in the Septuagint translation of Genesis to refer to the Garden of Eden, whence Old English eventually borrowed it around 1200. The Encyclopedia Mikrait lists pardes as one of the Persian words that entered into Biblical Hebrew. It appears three times in the Tanach: Shir HaShirim 4:13, Kohelet 2:5, and Nechemiah 2:8. In these cases it has the general meaning of "orchard", compared to the specific sense in Greek of fenced off areas belonging to the king. Kutscher points out that most of the Persian words that entered Hebrew at that time were related to governance, and therefore pardes probably originally was borrowed from the word referring to the parks or gardens of the king. On the other hand, Ben Yehuda mentions that the word pardesu was borrowed from Persian to Late Babylonian (Kaddari also mentions Akkadian), and perhaps from here pardes entered Biblical Hebrew. Then the Septuagint used paradeisos to translate both pardes and the more classic Hebrew word for garden, gan. So if Xenophon lived from 431 - 355 BCE, the word had certainly entered Greek rather strongly, since it was used in the Greek translation of the Bible only a few centuries later, and not only for the similar sounding "pardes". The word pardes is used metaphorically for the veil surrounding the mystic philosophy (Hag. 14b), but not as a synonym for the Garden of Eden or paradise to identify a blissful heavenly abode for the righteous after death. The popular conception of paradise is expressed by the term "Gan 'Eden," in contradistinction to "Gehinnom" = "hell."